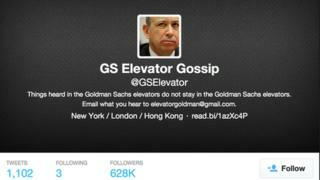 The creator of a satirical Twitter account purportedly based on comments overheard in the lifts at Goldman Sachs has been unmasked. John Lefevre, 34, who lives in Texas and has never even worked for the Wall Street bank, writes @GSElevator, reports the New York Times. Identified as a former bond executive, last month he sold a book based on the tweets for a six-figure sum. Goldman Sachs launched an inquiry to find out who was responsible. Mr Lefevre, whose Twitter account has 628,000 followers, told the New York Times he started it as a "joke to entertain myself"
People love comedy insider accounts like @GSElevator - but this can override any natural caution we might have to stop and question whether the account really is true. Of course, some might say it doesn't matter - they're only comedy accounts. But that's a slippery slope, especially for newsrooms. We constantly remind our teams to tread carefully with social media accounts. For example, checking for verified ticks that many social media sites use, to look at what's being posted and whether it stacks up, how long the account's been active, who it follows or is a fan of, can it be corroborated from information or confirmation sourced elsewhere. Sometimes it's just not possible to come to a definitive conclusion - in which case it's better to proceed very cautiously than take a risk and end up with egg on your face. It includes tweets such as: "I never give money to homeless people. I can't reward failure in good conscience." Another example is: "Suit #1: 'Was that an earthquake?' Suit #2: 'No, I just dropped my wallet.'" And another: "Some chick asked me what I would do with 10 million bucks. I told her I'd wonder where the rest of my money went." Mr Lefevre expressed surprise that it had taken so long for his identity to be revealed. Goldman Sachs issued what it said was a tongue-in-cheek statement: "We are pleased to report that the official ban on talking in elevators will be lifted effective immediately." Mr Lefevre was reportedly offered a job at Goldman Sachs' Hong Kong office in 2010, but the opportunity fell through when a previous employer argued that he was bound by a no-competition agreement. The former Citigroup worker said he had been inspired to create the account to poke fun at some of the remarks made by people he encountered in the financial industry, including Goldman Sachs employees. "I went into investment banking and I saw a group of people that aren't as impressive as I thought they were," he told the New York Times, "or as impressive as they thought they were."